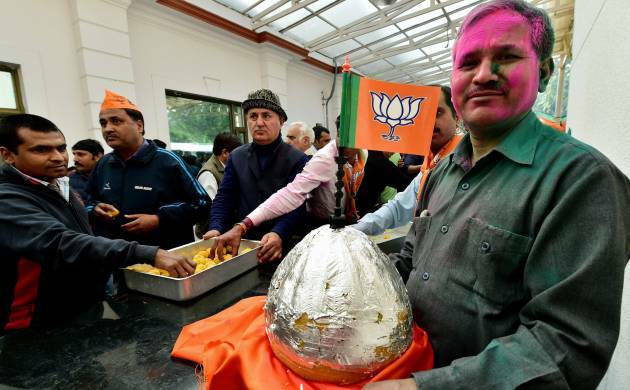 Anchored by Prime Minister Narendra Modi and party president Amit Shah, the BJP juggernaut rolled on in UP and in the neighbouring state of Uttarakhand, bagging three-fourth majority. The popular Congress Chief Minister Harish Rawat lost both seats that he contested in the hill state. The BJP on Saturday stormed back to power in Uttar Pradesh and Uttarakhand securing landslide wins while the Congress achieved a similar feat in Punjab and emerged as the single largest party in Goa and Manipur which threw up a hung Assembly. After a hiatus of 10 years, Congress led by former chief minister Capt. Amarinder Singh stormed to power in Punjab getting 77 seats, falling just one seat short of two-third majority. It was a birthday present for Amarinder who turned 75 today as the Congress routed the SAD-BJP combine and dashed hopes of Arvind Kejriwal-led AAP, which was confident of sweeping the Assembly polls on its debut. BJP leaders hailed the spectacular victories of BJP as a vindication of Modi’s popularity and his pro-poor policies with some calling it a “tsunami”. Shah, who crafted and conducted the election strategy in UP, said the results have catapulted Modi to the stature of the “tallest leader” since independence. “The only factor for the win is the performance of the Modi government,” Shah told a press conference in Delhi. “The outcome has shown the faith the poor have reposed in Modi... Even his political rivals will have to admit that he has emerged as the tallest leader in the country since independence,” he said. “This is the victory of the corruption-free rule and pro-poor policies under the leadership” of Modi, he tweeted earlier. The previous best showing by BJP in UP was in 1991, at the height of Ram Janam Bhoomi movement, when it got majority on its own winning 221 seats out of 425 in an undivided state. The highest number of seats bagged by a single party in the UP assembly polls was in 1977 when Janata Party got 352 seats when Uttarakhand was part of the state. BJP had not put forward any chief ministerial candidate in UP where it also did not put up any muslim candidate. The UP chief minister will be selected tomorrow by the BJP parliamentary board and the legislature party in the state. The ruling SP whose campaign was steered by Chief Minister Akhilesh Yadav on development agenda received a severe drubbing getting only 47 seats as against its previous tally of 224 while alliance partner Congress was reduced to single digits(7), down by 21 seats. SP received a major jolt in Lucknow Cantt seat where its patron Mulayam Singh Yadav’s daughter-in-law Aparna Yadav lost to BJP’s Rita Bahujuna Joshi, who left Congress ahead of the elections. BSP could garner only 19 seats in a huge slump from the previous tally of 80.